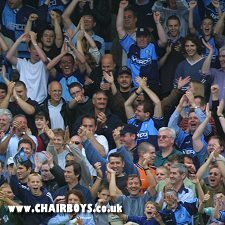 At the start of the 2004/5 season chairboys.co.uk dropped any attempt to preview the forthcoming games in too much detail. Our opinion was that there are plenty of commercial sites who take on this mundane task and we feel our efforts are better served on events that have actually happened rather than what has become an ad nauseam recycling of team speculation, dated injury news and innacurate waffle. In another excuse ridden move, as from the start of the 2006/7 season, we dropped our detailed match reports for much the same reasons but brief match reports we reinstated for the 2007/8 season and can be accessed via the Latest news page and indexed via the Results and Fixtures page. Opponents: For more on the opposition check out the 'League One (LFKA Division Two) links. This includes links to relevant websites and our own 'Quick Guides' which include directions to the opponents ground, relevant links, previous meetings and a look at those players who have played at both clubs. About us: Elsewhere on this page you'll find links to what we regard as the most useful matchday services plus all the vital information on Wycombe. If you're a first time visitor to Wycombe you may find our Rough Guide useful. It's probably out of date but not that much changes in High Wycombe. Of course, for those with a strong stomach, there's always the message board at www.gasroom.co.uk where can you leave you own match preview and real time comments or just simply read what others have to say.